One of my favorite photographic things to do is to simply walk around urban areas and look for scenes grab my attention. They can range from wide, scenic views to detail shots of something that just happened to catch my eye. Some of the cities that I like to frequent include Hampton, Norfolk, and Richmond, all of which have their own unique visual signature. Richmond is just over an hour away and provides plenty for the photographic eye. The old downtown area has been going through a revitalization in recent years but much of the old is still there and is being preserved. On this particular day, the sky was a perfect mixture of blue sky and white clouds providing plenty of sunshine and shadows to work with. There is so much to see here that one trip is not enough to even scratch the surface. Consider checking out the Shocko Bottom area. Park there and just start walking and you will find a plethora of architecture and style to keep you busy behind the lens all afternoon. 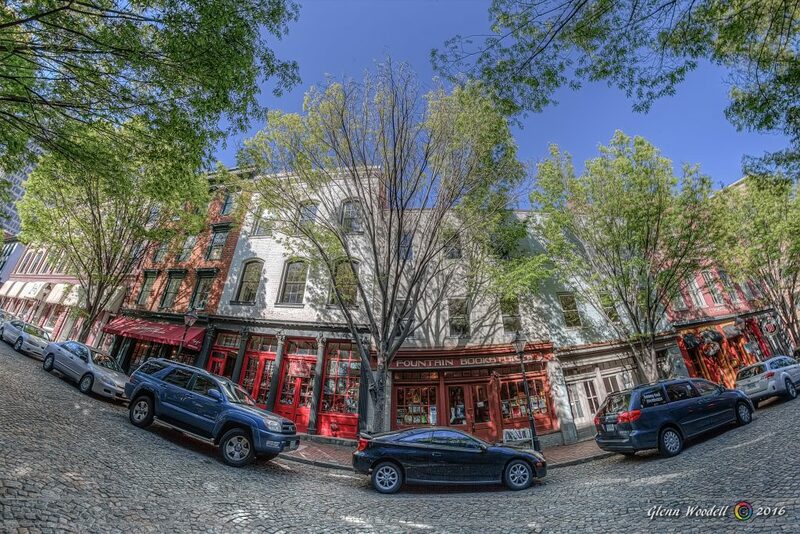 It took a fisheye lens and three different exposures to capture this street scene. If you park at the locks you can walk along the canal to start your journey as there is a lot to please the eye there. Wide lenses will be necessary to capture the all that is around you. I usually carry two full frame camera bodies, one with a 16-35mm zoom and the other with a 70-200mm. I keep the fisheye handy for the extreme views that I always seem to find. Here, you’ll find lots of people walking, jogging, or biking along the canal. 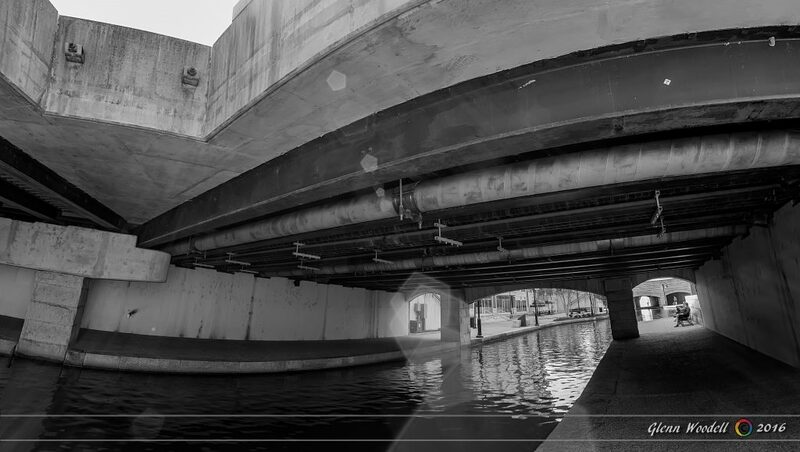 Where the canal goes under the roads, you can find all sorts of interplays between light and shadow, with little surprises around every corner. Here, the fisheye came in handy for this all-encompassing view. 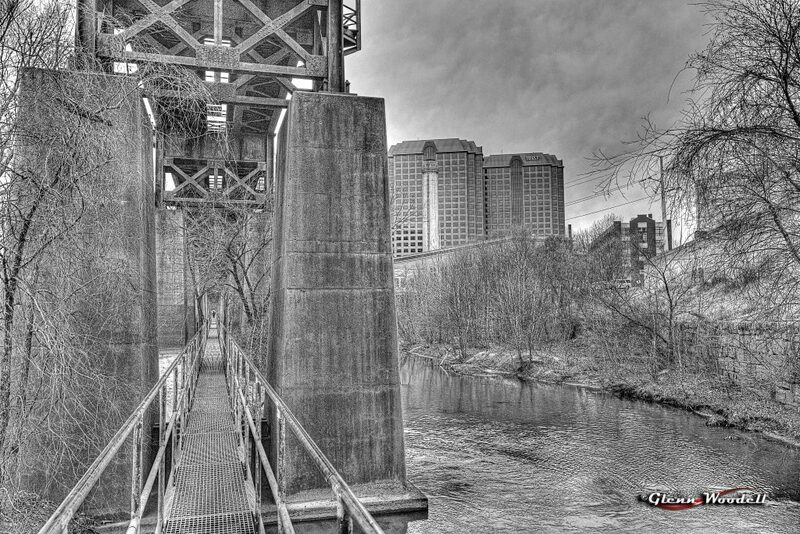 Be sure to check out the pipeline walk along the rapids of the James River. With ever-changing views, this is a must-do. Here again, wide lenses come in handy with the downtown coming into view. A narrow stairway leads down the bank of the river to the half-mile long pipeline where you have an easy walk, complete with hand rails and a sturdy metal walkway. Beware however that after the first quarter mile or so, both the rail and the walkway terminate, leaving you with only the curved, bare concrete pipe itself and the water below. It’s quite shallow when the water level is low but that can change drastically as the river swells with the flow. Back up to the road level, you are greeted once again with lots of exciting architecture. Above is the train station that is worthy of a walk inside. 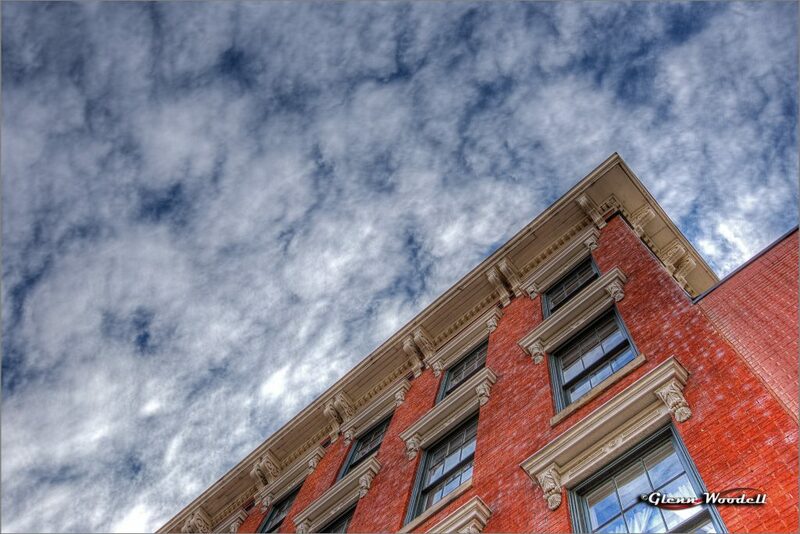 Like Richmond, the warehouse district of Charlottesville still has plenty of old buildings mixed in with the new. 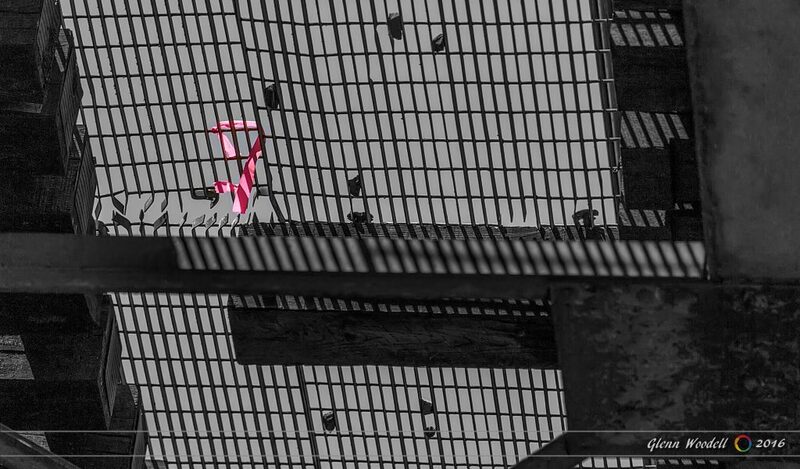 Here, from beneath this trestle, a solitary ribbon seems to mark an area of needed repairs. 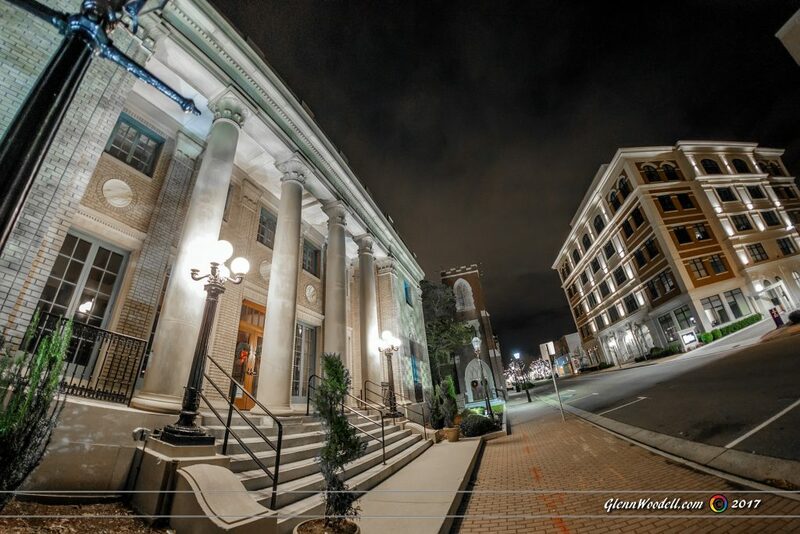 Nighttime in a city can be fun to shoot because it’s so much easier to see what’s going on inside lighted building. 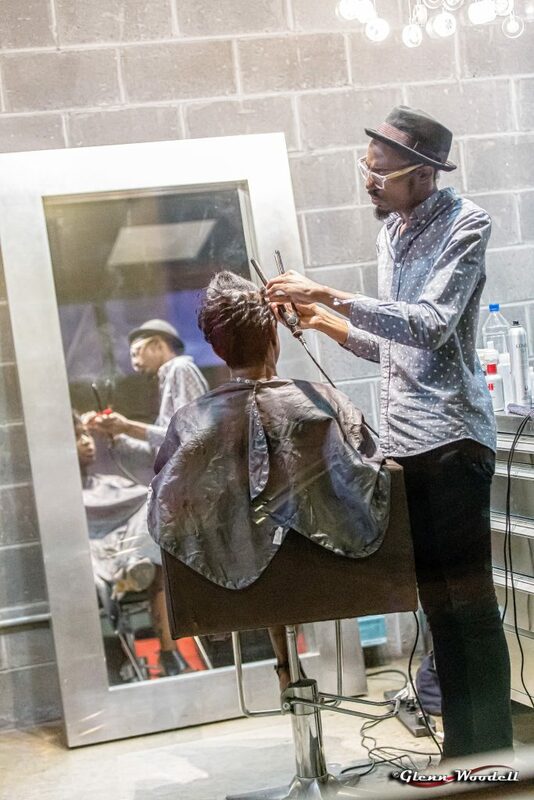 Here, a woman is getting her hair styled in the Ghent section of Norfolk. Lens hoods are especially helpful when shooting through glass as they greatly reduce reflections from behind. 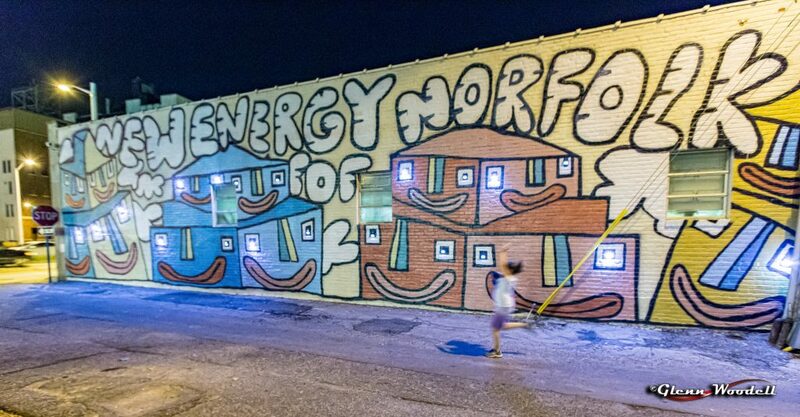 Norfolk’s neon district, also in the Ghent area, is full of colorful wall art and graffiti from local artists as well as neon lights and light sculptures. Of course the downside to shooting at night is the low light available. I shoot with f2.8 lenses, usually wide open, which makes for shallow depth of field. 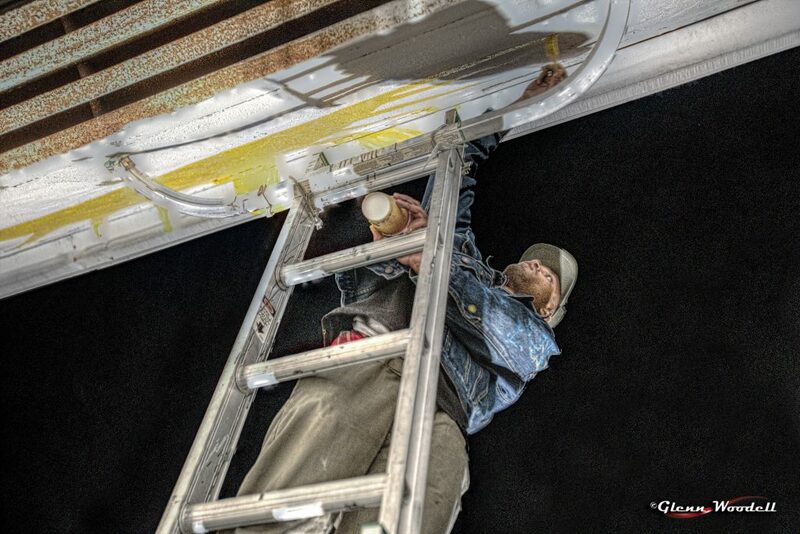 I used a 70-200 for the shot of the artist above, after asking him to try not to drop paint on me. Once a year, there is a neon celebration where some of the businesses become evening art galleries. 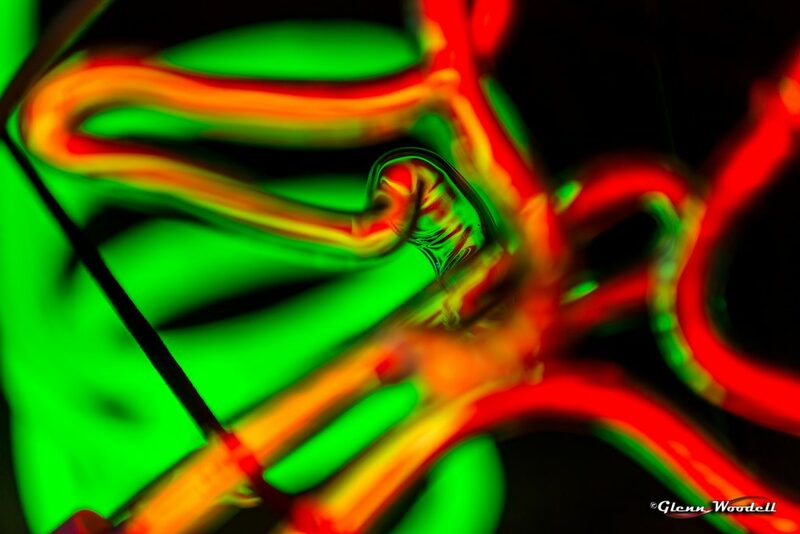 This is a macro shot of one of the neon sculptures in one of the galleries. 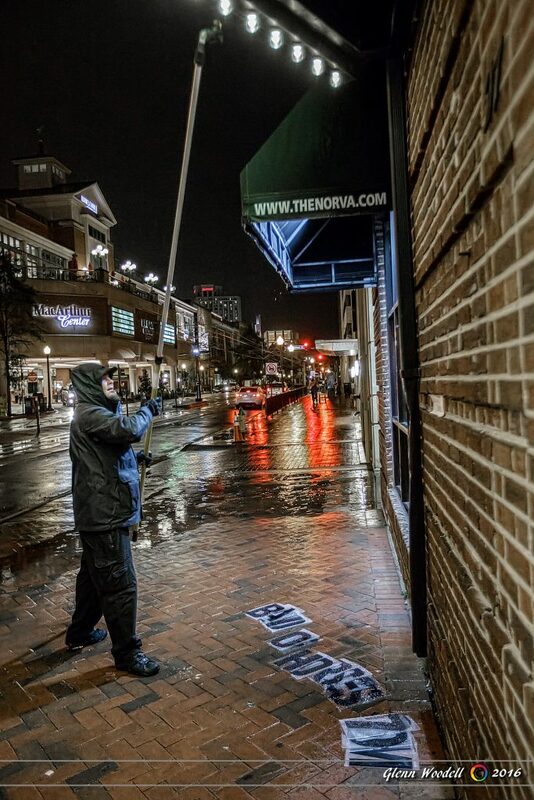 Toward the downtown area of Norfolk one can find the historic NorVa. It started out as a Vaudeville theater in 1917 before becoming a movie theater in the 70s. It then became a men’s gymnasium and finally the live entertainment theater as it exists today. It has hosted the likes of James Brown and Prince. Although it’s not a large city by any means, downtown Newport News has a few high rise apartments. A moderate length lens is plenty for capturing it all around you. Newport News forms one half of the lower peninsula of Virginia and is bounded by the James River and the Hampton Roads harbor. In addition to a very large shipyard, the Navy keeps a few crane ships anchored right by the downtown area. 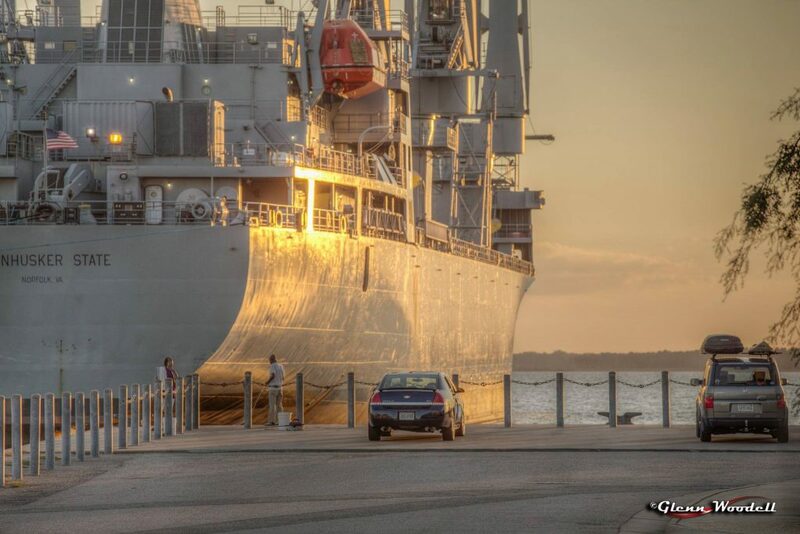 This is a sunset shot of one of those ships. 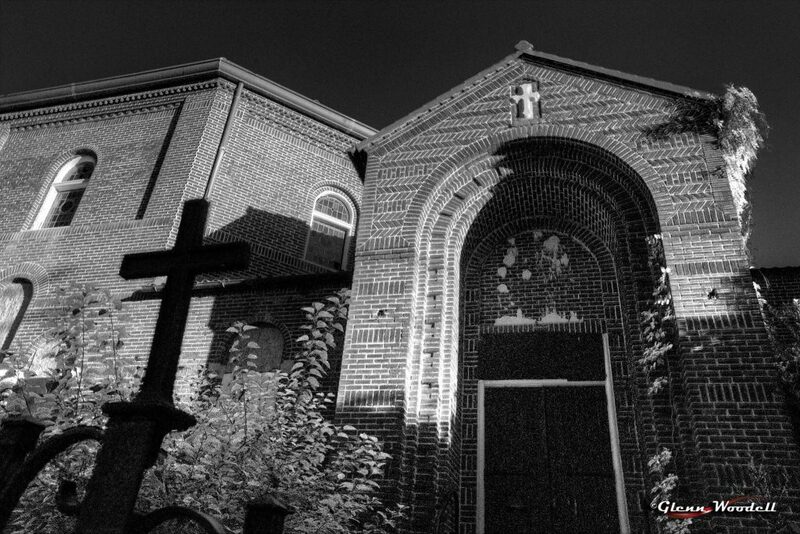 Also in the downtown area of Newport News are several old churches. 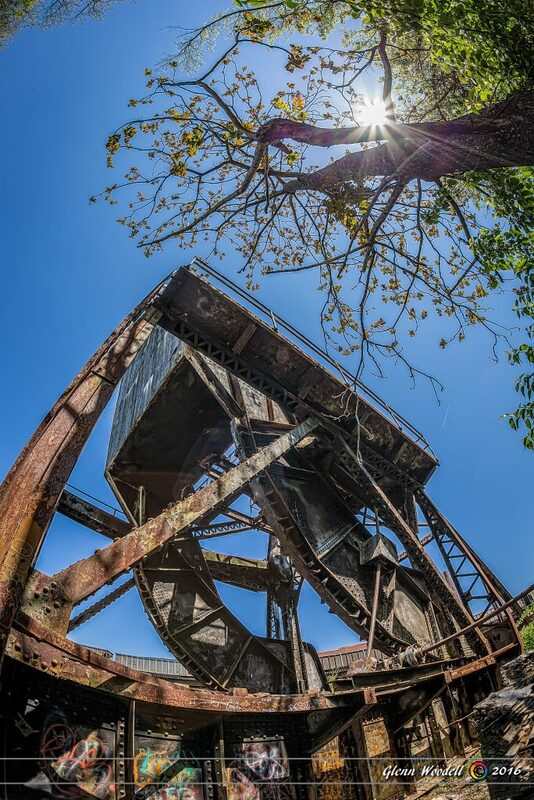 A 16mm shot under clear blue skies reveals a stark contrast in this shot. The other half of the lower peninsula is taken up by Hampton and is my home town. 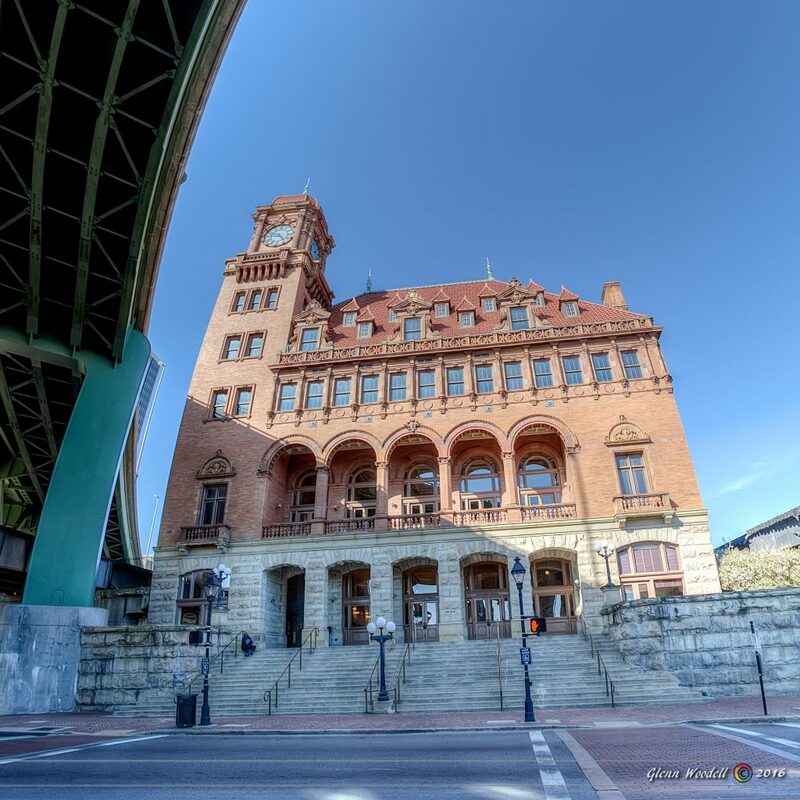 This fisheye view of the downtown area shows the old post office on the left contrasted by a new bank building on the right. Just a short walk away is the waterfront on Hampton Creek where you can find several seafood businesses that have been operating here for many years. These are the boats of the Amory Seafood Company. 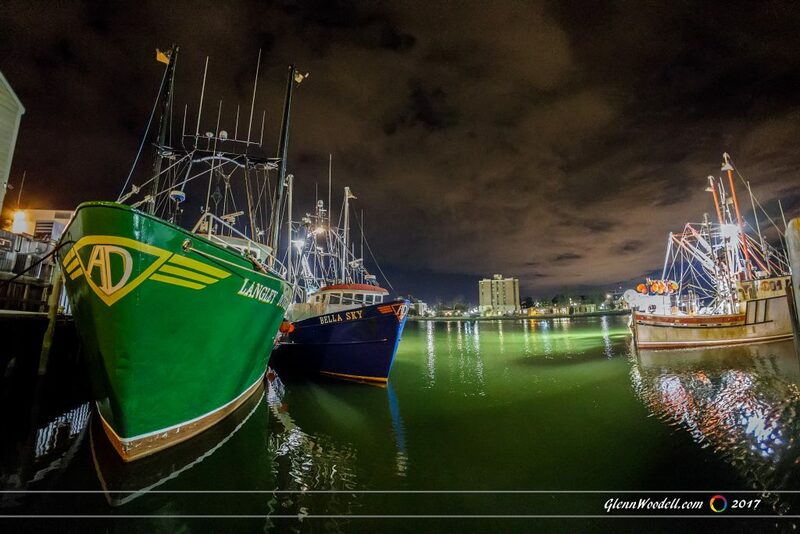 Another fisheye view brings the boats together to frame Hampton University on the opposite shore. 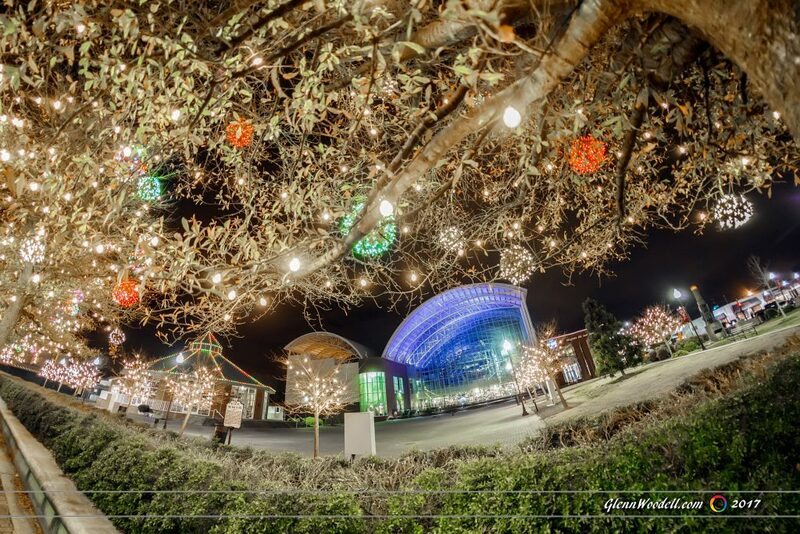 This view captures the Virginia Air and Space Center in blue and the historic Hampton carousel under the Christmas holiday lights.